A wedding anniversary is not just a day of mere celebration. It is a day of remembrance and honoring the love and commitment that two people share with one another. Marriages that last are so special and it is important to commit to the aspects of a relationship that create longevity. Throughout the year, it can be easy to get caught up in a busy, fast-paced life with little to no time to stop and spend quality time with your spouse. So you will certainly want to make your anniversary a special day to remember and show your spouse how much you truly appreciate him/her. Here’s 30 wedding anniversary wishes that are sure to show your spouse how much you appreciate the years you’ve spent together and the years to come. For your other half: Wish Happy Anniversary to your wife or husband. On our wedding anniversary, there is a lot to be thankful for. I am thankful for the moments we share in laughter, the family we’ve built together, and our love that last forever. Thank you for sharing your life with me. With all my love, Happy Wedding Anniversary! With each year, our love grows stronger, our hearts grow fonder and our trust reaches farther. Happy Wedding Anniversary from the bottom of my heart. Some memories get lost, some memories get cloudy and drift farther away. But the memories I have with you forever shine bright. May our love bring us joy as we celebrate another year of making memories. Happy Anniversary! Happy Anniversary to the love of my life. I want you to know that I respect you as an equal partner though it seems you give far more than your share of love and support. I am truly grateful for your dedication to our marriage. Marriage has its ups and downs. Baby, you make it worth the ride. Let’s enjoy our anniversary together. To my wife on our anniversary, you grow more beautiful as time passes by. Your beauty is lasting because it is rooted in your heart. Have a wonderful anniversary, dear. To my husband, I could have never dreamed up a husband as loyal, caring, and loving as you. Happy Anniversary to you. Time has lost its sting. Our love grows deeper and wider with passing time. Happy Anniversary. I used to dream of traveling the world. I used to dream of throwing caution to the wind. Now, my biggest dream is to share all life’s gifts with the one I love. Happy Anniversary! With each year our love grows stronger, our hearts grow fonder and our trust reaches farther. On our wedding day, we celebrated two lives coming together as one. 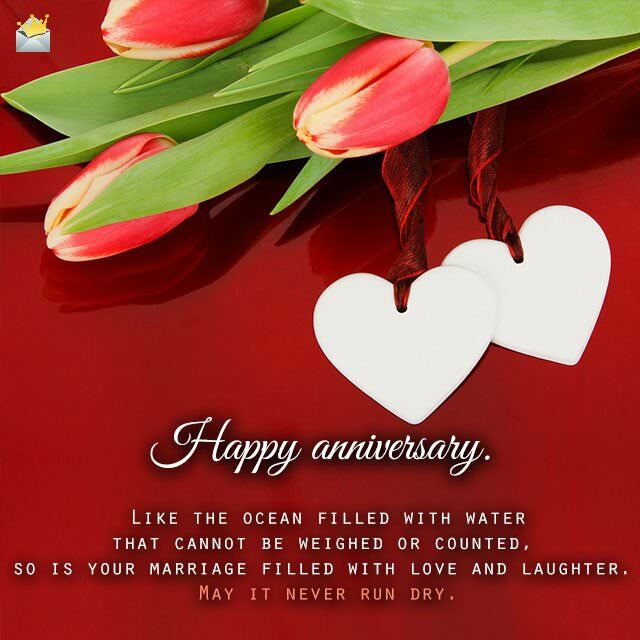 On our wedding anniversary, we celebrate that commitment and the promises that remain intact. All my love, Happy Anniversary. Simple moments bring the greatest joys; the smallest things bring the greatest pleasures. Thank you for bringing the light to my life. Happy Anniversary, from my heart to yours. How is it possible that our love could grow sweeter as the years go by? Hoping to make our anniversary one to remember. Love has taught me to love you more than I love myself. Hope has taught me to expect the best from our relationship. 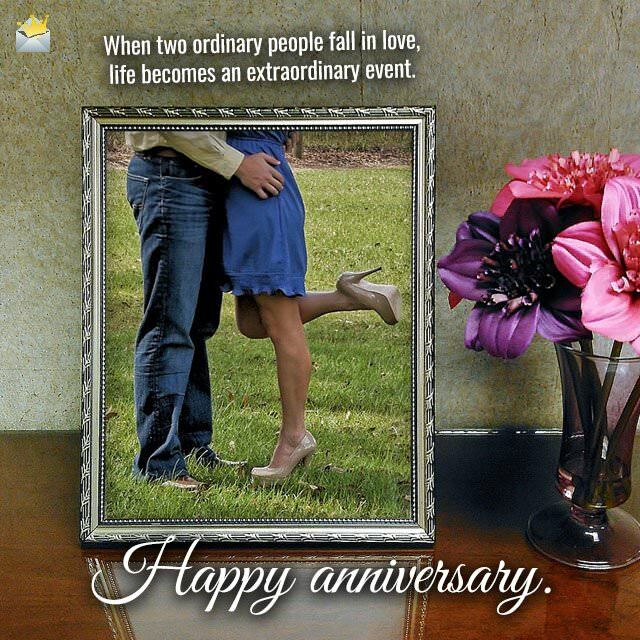 Looking forward to many more anniversaries to come! Happy Anniversary! What we have is worth holding onto. This anniversary let’s cherish the year that has passed and look forward to the years to come. Being your wife is the most important role I play in life. Our love is my main source of inspiration. Thank you for being a wonderful husband. Happy Anniversary. Dear Wife. Honoring my commitment to you is the easiest task. It is second nature to give you all the desires of your heart. I love you forever. Happy Anniversary, from your loving Husband. The day we said “I do” is a day to remember. Every moment thereafter has been true bliss. I wish you a very happy anniversary. 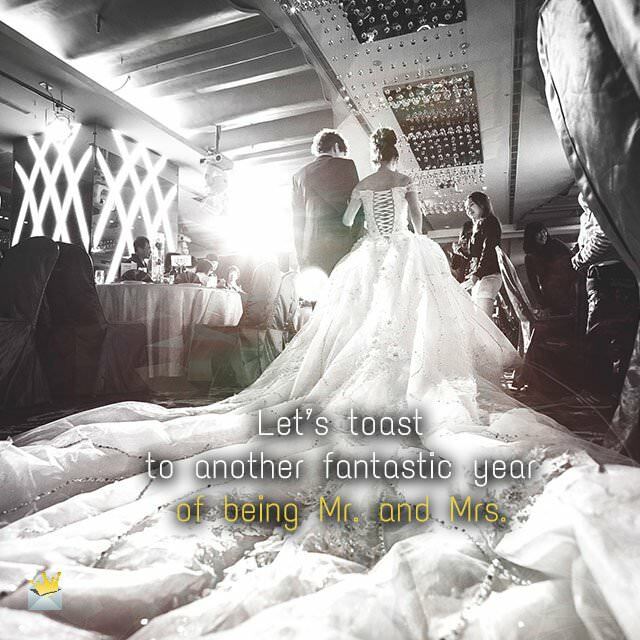 Let’s toast to another fantastic year of being Mr. and Mrs.
You are the best life partner. I couldn’t imagine growing old with any other person. You have taught me that Love is life’s greatest gift. Happy Anniversary to you and I wish us many, many more to come! I never knew beauty until I laid eyes on you. I never knew kindness until you welcomed me in your heart. I never knew love till I fell in love with you. Happy Anniversary, to the greatest wife! Dear Husband, you chase my nightmares away. Being in your arms is the safest place. Thank you for your tender love and care. Hoping this anniversary will be one to remember! The laughter and love that we share will grant us a healthy life and a long-lasting marriage. Happy Wedding Anniversary! Congratulations on making it through another year with me. May our wedding anniversary bring as much bliss as the past years have been with you. The best decision I ever made was saying “I do.” Glad to be your life partner and I hope the feeling is mutual. With all my love, Happy Wedding Anniversary! The most challenging task I’ve ever faced is attempting to express all my love for you. There is no gift, no amount of money, no bouquet of flowers that could ever truly express the love that fills my heart for you or the joy I feel being with you. Happy Anniversary, Sweetie! Wishing us a wonderful celebration of our marriage anniversary. Never letting go of you won’t ever be a challenge. I cherish our marriage. Happy Anniversary, Baby. Let’s light the candles and spend the evening hand in hand. Our marriage has been heaven on Earth. It is my pleasure to walk through life with you. May this anniversary bring us wonderful memories. This wedding anniversary, I want to thank you for your unrelenting support. I vow to always be there when you need the way you have been there for me. Material things are less important when you have a love and trust like ours. Our love brings about the intrinsic rewards that material things can’t offer. As long as I have you, I have all I need. Happy Anniversary to us! If love is like the wind because we cannot see it but we can feel it, then your marriage is a beautiful tree and your kisses are its leaves. Happy anniversary. Like the ocean filled with water that cannot be weighed or counted, so is your marriage filled with love and laughter. May it never run dry. Happy anniversary. Now you have a family, kids counting one, two, three, may your anniversary be as special as the first one filled with glee. Happy anniversary. Your relationship reminds me that walking together in the rain is always better than walking alone on a cloudless day. Happy anniversary. You two are the reason I want to fall in love someday. Happy anniversary. Like the stars in the sky, so are the many heartfelt moments you have shared together, too many to be counted. May you share many more in years to come. Happy anniversary. If life were a garden, the seeds of your love would grow the most beautiful roses ever seen. Happy anniversary, friends. At times you may hate each other like Tom and Jerry, but you two like them are inseparable. Happy anniversary. Some say you can’t live without love, but others still think breathing is important. Don’t forget to breath. Happy anniversary. Glad you two found each other. Now you can bother each other with your calls, late night dinners and annoying jokes. Happy anniversary. If Santa asks me about my relationship goals this year, can I show him a picture of you two? Happy anniversary. When you see married couples walking together, the one who is in front is usually angry. I suggest you both do some power-walking and keep up with each other. Happy anniversary. They say there are many recipes for a successful marriage. But the one thing that beats them all is learning to say: “I will do the dishes.” Happy anniversary. A great marriage is not when two perfect people get married. It is when two imperfect people fall in love with the imperfections. Happy anniversary. A happy marriage is a conversation that never lasts long enough. May yours be never-ending. Happy anniversary. The best kind of love is the one that can make you come alive inside and reach for all that you wish to be. Happy anniversary. I’m so happy that two of my favorite people became best friends and got married. Those people are you two. Happy anniversary. Love is the ingredient that turns the dust of everyday life into a golden masterpiece. Your love is truly art. Happy anniversary. When two ordinary people fall in love, life becomes an extraordinary event. Happy anniversary. Happy love life day. Happy marriage day. Happy I’m so jealous of you day. There are lots of ways to say this… Happy anniversary. There is no better offering in life of love, friendship or charm than a great marriage. Happy anniversary. Happiness is having someone to hold, someone to listen, and lips to kiss. Happy anniversary to someone who deserves to be this happy. It is during the darkest moments that we are able to see the brightest people in our lives. Glad you found your light in the darkness. Happy anniversary. If love is the force that drives out all our worries in life, then marriage should be a daily guide to life’s precious moments. Happy anniversary. Like cream and sugar mixed together, you guys make a deliciously great couple. Enjoy each moment together. Happy anniversary. Some say love is like a friendship that caught aflame; so it looks like you two are BFF’s for life. Congrats on your anniversary. Love is often the one thing that propels us towards greatness, in faith of a brighter future. Here is hoping that your marriage will be a forever reminder of these truths. Happy anniversary. A kiss can melt away worries, a smile can soften a heart, and a touch can bring immeasurable joy. Hoping your marriage is filled with all this and more. Happy anniversary. A good marriage is when two forgiving people decide to do life together. Happy anniversary. A honeymoon is like having a sleepover where no one sleeps on the couch. Hope yours lasts a lifetime. Happy anniversary. Love is a valuable thing, and we never have enough until we give it away. Happy anniversary. Everyone has a story to tell, but your love story is the most beautiful of all. Happy anniversary. If others can love to the moon and back, you two have built your own planet. Happy anniversary. Marriage is talking with your eyes, listening with your heart and showing approval with a warm hug. Happy anniversary. They say love can be blind, but marriage brings love into reality. Happy anniversary. The secret to a great marriage is falling in love every morning and making sure the person you fall asleep with is the same person you woke up with. Happy anniversary. Cows go moo, chickens cluck and pigs oink, but you two rule the barn house! Happy anniversary.